Verborgh, R.; Steiner, T.; Van Deursen, D.; Van de Walle, R.; Gabarro, J.
Hyperlinks and forms let humans navigate with ease through websites they have never seen before. In contrast, automated agents can only perform preprogrammed actions on Web services, reducing their generality and restricting their usefulness to a specialized domain. Many of the employed services call themselves RESTful, although they neglect the hypermedia constraint as defined by Roy T. Fielding, stating that the application state should be driven by hypertext. This lack of link usage on the Web of services severely limits agents in what they can do, while connectedness forms a primary feature of the human Web. An urgent need for more intelligent agents becomes apparent, and in this paper, we demonstrate how the conjunction of functional service descriptions and hypermedia links leads to advanced, interactive agent behavior. We propose a new mode for our previously introduced semantic service description format RESTdesc, providing the mechanisms for agents to consume Web services based on links, similar to human browsing strategies. We illustrate the potential of these descriptions by a use case that shows the enhanced capabilities they offer to automated agents, and explain how this is vital for the future Web. Verborgh, R. [et al.]. 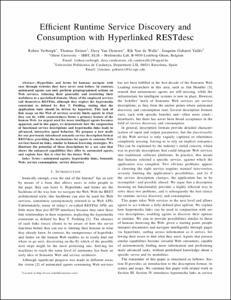 Efficient runtime service discovery and consumption with hyperlinked RESTdesc. A: Next Generation Web Services Practices. "2011 7th International Conference on Next Generation Web Services Practices (NWeSP)". Salamanca: IEEE Computer Society Publications, 2011, p. 373-379.